The I Series I34R Compact Crusher, McCloskey's newest impactor, will be on display at bauma 2019, and is designed for projects with small footprints but big requirements. Located at Stand FS.1211/1 in the Outdoor Exhibition Area South, the 913m2 (9,827 ft2) space will showcase the newest products from McCloskey International, as well as serve as a venue for customers to meet and mingle with dealers from around the world, as a hub for the McCloskey Group of Companies. On display will be a new ground breaking screening product, which will be revealed at the show with details available as of April 8th, 2019. The new screener will be joined by the latest crushers (compact and full-size impactors), stackers, and a compact sand plant from McCloskey Washing Systems. Lippmann-Milwaukee, the most recent member of the McCloskey group, will also be on-site to unveil their exciting new products to the world. Crushers will be in the spotlight at bauma 2019, with McCloskey's I Series I54Rv3 (above) and a I34R compact crusher on display at the event. According to McCloskey International, bauma is the perfect opportunity to showcase the new features and benefits of their I Series impact crusher line, particularly well-suited for aggregate and concrete recycling applications. The I54RV3 crusher has been enhanced with production boosting features, including a new main conveyor, new impactor transfer chute, prescreen with a steeper bottom deck for enhanced material flow, and a simplified rear profile for the impactor chamber. The I54Rv3's radial return conveyor features full length dust suppression control, allowing operators to recirculate oversize material from the screenbox back to the feed hopper or radial a complete 90° while running. The I34R Compact Crusher, McCloskey's newest member of the impactor family, is the perfect solution for projects with small footprints but big requirements. These compact, mobile crushers are suited particularly to construction and demolition recycling, asphalt recycling, and aggregates. According to McCloskey, these compact impactors deliver high performance and expanded versatility in a highly mobile lineup to customers around the world. 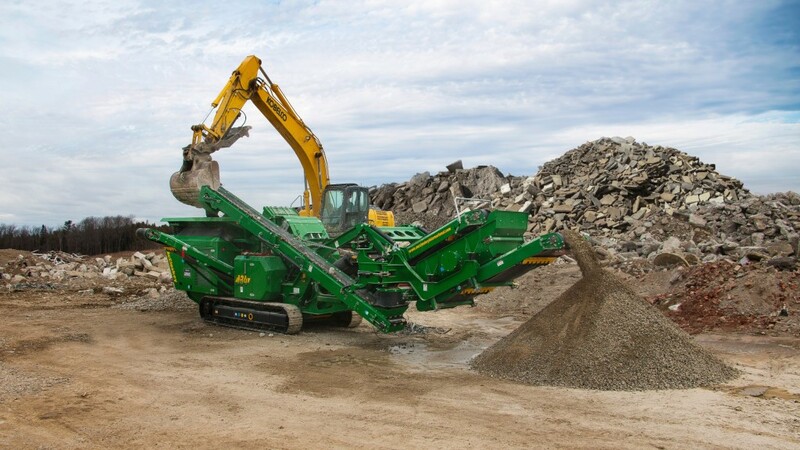 With their fast set-up time and ability to nimbly move around in tight spaces, the crusher's small footprint is uniquely suited to the recycling, demolition and smaller scale construction projects where space is at a premium, and maneuverability is key. The compact transport dimensions (less than 2.5m wide) allow easy transport from site to site. Bauma visitors this year will also get a first look at McCloskey International's new tracked radial feeder stacker - the ST100TF Radial (above), with an innovative Patent Pending design that allows the switch from track to radial mode in seconds. Built-in levelling indicators allow operators to position the stacker regardless of the ground evenness, with independent hydraulic jack legs to stabilize once in place. A level gauge allows operators to position the stacker for maximum production. The tires on the ST100TF Radial have an aggressive tread pattern for better traction in rough terrain. All the new radial stackers feature a patented rear counterweight that counter balances the tracks and wheels, enabling a much higher stockpile capacity and delivering greater stability to the stacker while in operation. The ST100TF Radial's unique tool free transport design allows the equipment to move freely from site to site without needing to remove the wheels, delivering true portability for multi-site projects and operations. McCloskey Washing Systems will present the CSP120 at bauma 2019 (shown left) which delivers superior separation efficiency, produces the driest, drip-free final washed sand product in its class, and produces up to two in-specification sands, to desired grade, at up to 120 total tph. As with all McCloskey products, the plant has been designed with the machine operator in mind. In addition to the highest level of quality and performance, significant benefits include simple and fast assembly times, ease of operation, low maintenance and an overall reduced footprint. The CSP range can be tailored to suit any sand application, regardless of desired tonnage, ranging from 40 tph - 300 tph. During its expansion over the past twelve months, McCloskey acquired Lippmann-Milwaukee in the third quarter of 2018. Lippmann is a leading manufacturer of aggregate crushing equipment for processing applications. Headquartered in Milwaukee, Wisconsin, USA Lippmann was established in 1923 and has dedicated itself to producing the highest quality crushing equipment on the market. Since its inception, Lippmann has become synonymous with highly productive and reliable heavy-duty jaw crushers that are built to last. Recent product introductions, including a tracked product range, the 4800R closed circuit crushing plant and the 3055 jaw crusher demonstrate Lippmann's continued focus on designing and building the best crushers for customers worldwide. Over its 95-year history, Lippmann has developed a gold standard reputation for heavy duty stationary and semi mobile products. The Lippmann product line includes jaw and impact crushers, feeders, recycle, two-stage crushing systems, and an extended line of ancillary products. For more information on Lippmann-Milwaukee please visit lippmann-milwaukee.com.